While first beginning her pursuit of wanting a change in scenery, Erika Coleman, a native of Rushville, decided to invest in herself and what she wanted to do. Putting her savings and good name on the line was a small price to pay for doing what she loved to do. After 20+ years of dentistry and spending the last 17 years of her life as a dental hygienist, she bought herself a ‘98 Ford work van and dove headfirst into her passion, making a splash nearly on impact. Starting off, work was slow; it took working for close to nothing just for the opportunity to get her name out there and to keep adding on to her love of home renovation. These risks taken early on have since been rewarded. Primp My House, a local business run out of Jacksonville, puts a very detail-first kind of work in an area in which that is key. 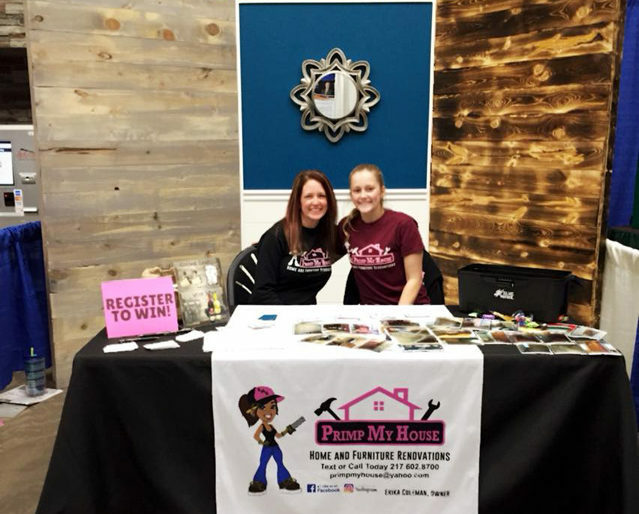 She took that in; plus, her father, brothers and close friends who have always had a hand in construction inspired her to begin her very own home remodeling company. Finding a source of therapy through her work, Erika said that through the painting of walls, plank walls, and the thicket of customers old and new lined up to see what the deal is, she has found it easy to keep what she loves to do fun for herself. Surprising her customers and occasionally herself, she constantly keeps herself entertained, giving her the time and confidence to work on perfecting the craft that she holds on such a high pedestal. Her job is serious, but fun; tough but rewarding. Taking yourself too seriously seems to be the downfall of most things in life, so this is the area where Erika seems to have a noticeable advantage on her competition. The concept of putting the customer first is a statement most businesses love to say with reiteration; however, it is an action which happens rarely in the real world. The proof is when it comes to referrals from past customers to new ones; they make it clear that putting the customer first isn’t just a statement that she says because she believes that it’s what the customer wants to hear. 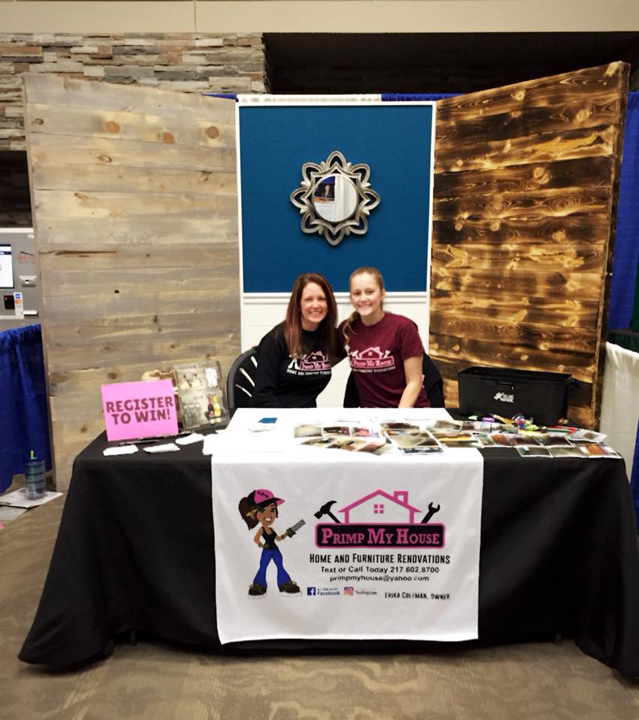 Seeing that she has started from nothing to having her own booth at the annual Springfield Home Expo, there is seemingly no cap on how far this company can go. In just the short amount of time that they have had their doors open for business, she has made sure that those who also hold the title of carpenter that she is here and ready to do what it takes to truly make a positive impact on not only her customers but the entire landscape of what home remodeling work should be. The desire to be a success and establishing herself as a force that the likes haven’t been attained. first and being such a welcoming personality have definitely made her opposition take note of who she is and how efficient her work through her company is. With the exception of roofing the list of what Primp My House does to be a top name in home renovation is staggering, from painting as previously mentioned to kitchen remodeling, she does burnt wood walls which are stunning pieces not only to look at but to watch come together as well. Interior decorating, precision painting, flooring, backsplash, plumbing fixtures, lighting, door replacements, woodwork restoration, furniture makeovers, wooden plank walls, furniture building. Personality and detail oriented work have kept the customers of Primp My House returning. Giving a friendly personality and the work indistinguishable from that of a seasoned home renovator. 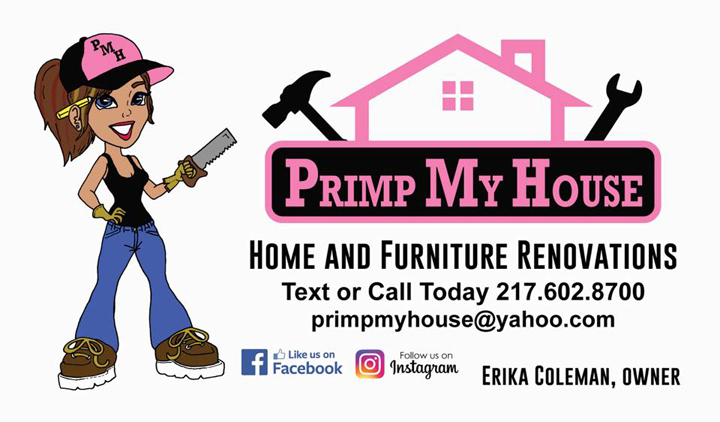 Contact Erika Coleman of Primp My House for your estimate at 217-602-8700, also feel welcome to find them on Facebook through which she can also be contacted.